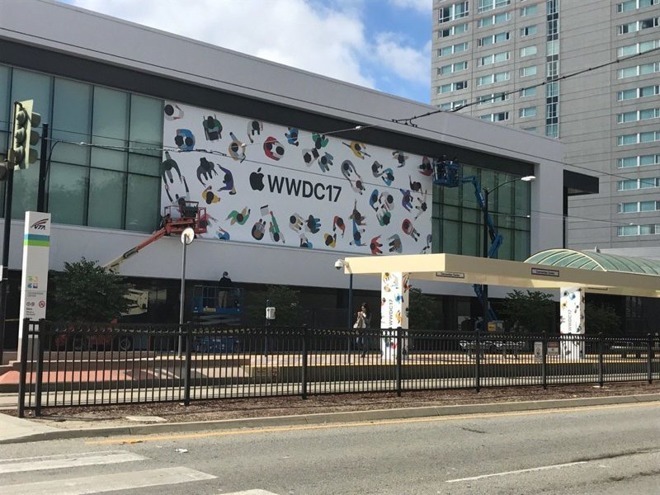 In preparation for Apple's annual Worldwide Developers Conference, set to kick off next week, workers have begun putting up decorations around the McEnery Convention Center in San Jose, Calif. The conference's familiar imagery can be seen not just on a banner over the center, according to Twitter posts, but on lamp posts and even pillars at a nearby public transit station. More decorations are presumably being put up inside, as at past WWDCs. This year's event is set to begin with an Apple keynote on June 5. While much of the company's time will probably be spent showcasing the next versions of iOS, macOS, tvOS, and watchOS, it's also expected to make its first WWDC hardware announcements since 2013. Those should include new iPads, upgraded MacBooks, and potentially the company's rumored Siri home speaker. That device is allegedly already in manufacturing, but set to ship sometime later in 2017, perhaps well after June. A number of unofficial gatherings will be taking place concurrent with WWDC. Some of them, like concerts and podcast recordings, are being highlighted on Apple's Beyond WWDC webpage. The decision to host WWDC 2017 in San Jose caught some people offguard, since for years Apple has preferred San Francisco, specifically Moscone West. The company said that San Jose would be more convenient for participating staff, but it may have needed too much time to set up.